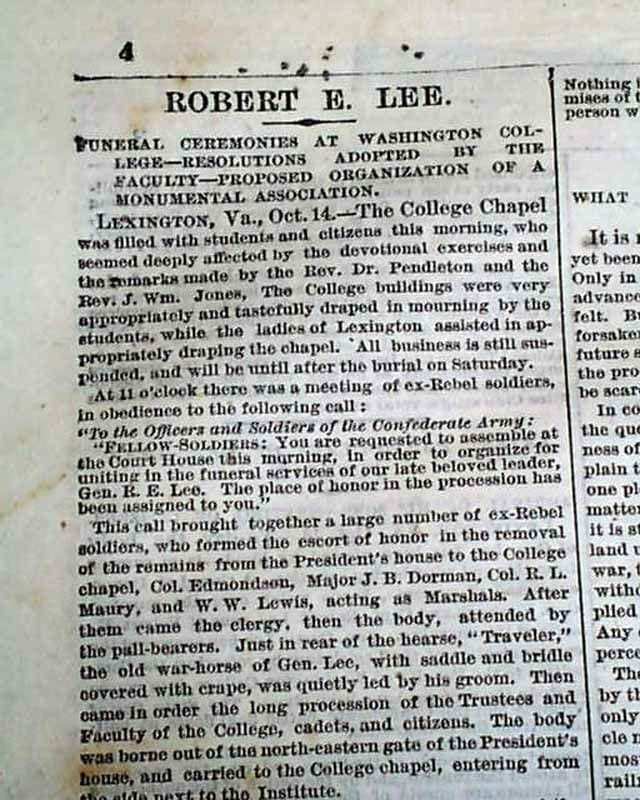 As a cadet at the Virginia Military Institute, William Nalle 1848-1911 was one of the Guard of Honor to stand over the body of Gen. Robert E. Lee during his funeral. 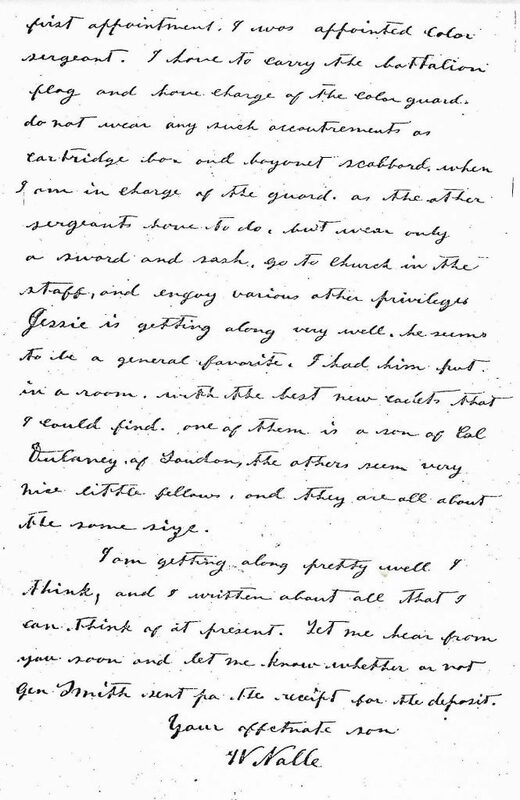 In the following letter, Nalle writes home to his mother Columbiana Major 1824-1898, wife of Thomas Botts Nalle 1816-1893, informing her of the event. Adj. Gen. William Nalle is a first cousin, 3 times removed of Clarissa “Clara” Nalle the spouse of John M. James. Their descendants, too, are relatives of the Adjutant General. I expect you have been looking for a letter from me for some time and in fact I would have written but about the time I thought of writing the rains & the flood came on, destroying bridges canals, & cutting off communication generally. 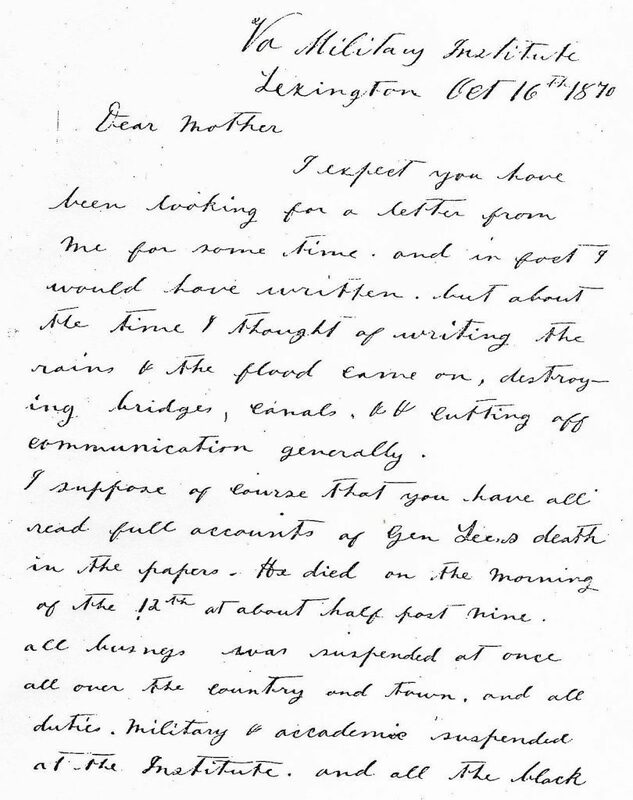 I suppose of course that you have all read full accounts of Gen. Lee’s death in the papers. He died on the morning of the 12th at about half past nine. 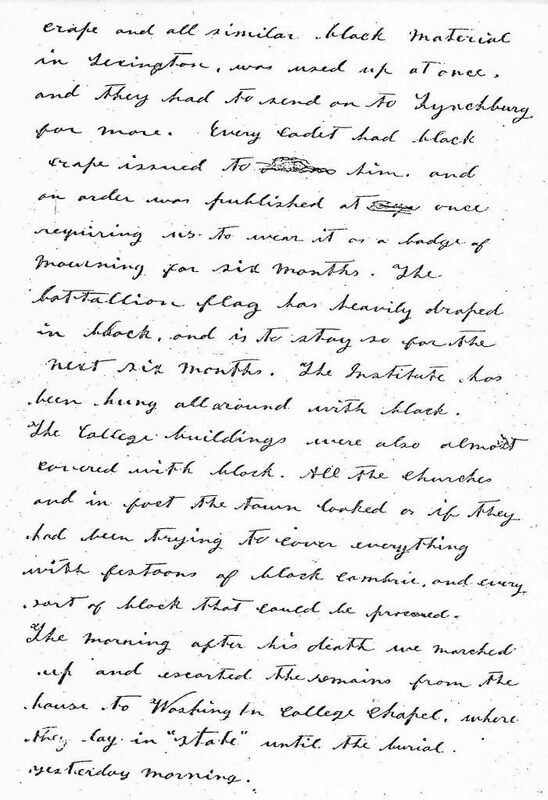 All business was suspended at once all over the country and town, and all duties, military and academic suspended at the Institute, and all the black crape and all similar black material in Lexington, was used up at once, and they had to send on to Lynchburg for more. Every cadet had black crape issued to him, and an order was published at once requiring us to wear it as a badge of mourning for six months. The battalion flag has heavily draped in black, and is to stay so for the next six months. The Institute has been hung all around with black. The College buildings were also almost covered with black. All the churches and in fact the town looked as if they had been trying to cover everything with festoons of black cambric, and every sort of black that could be procured. The morning after his death we marched up and escorted the remains from the house to Washington College Chapel, where they lay in “state” until the burial yesterday morning. 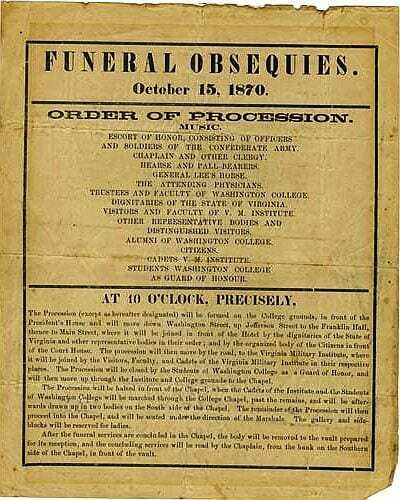 After the remains were placed in the Chapel on the morning of the 13th the entire procession was marched through the Chapel, past the corpse, which they were allowed to look at. The lid of the coffin having been taken off for that purpose. I saw the General after his death, and never saw a greater change than must have taken place in him a short time before he died. Some days before he was taken I met him in the path leading into town, coming in direction of the barracks. He was walking, and seemed to be the picture of health, and when I saw him in his coffin, he looked to be reduced to half his original size, and desperately thin. When first taken with the paralytic stroke or whatever it was, he fell on his dining room floor, a bed was placed under him and he died where he fell. The doctors forbid anyone to move him. 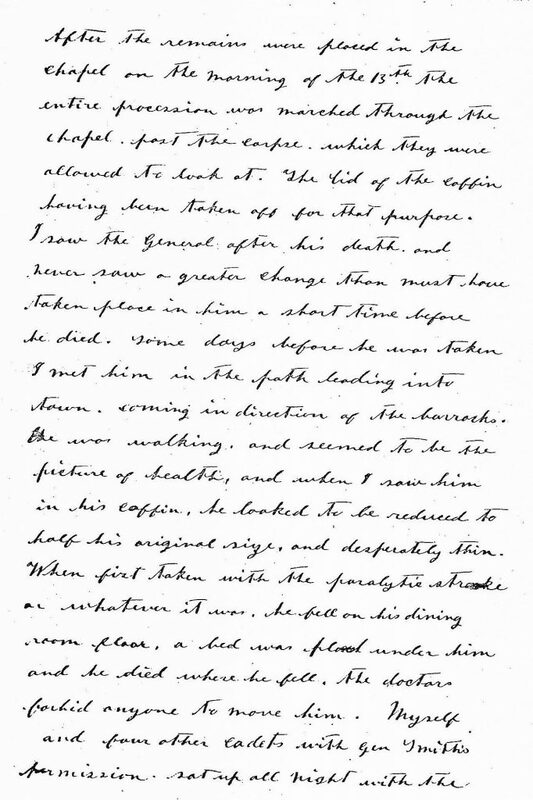 Myself and four other cadets with Gen Smith’s permission sat up all night with the corpse on Friday night, perfect silence was kept the whole night, no one speaking except in a low whisper. It was considered a great honor to be allowed to sit up with the remains, and a great many applied for the privilege but one of the college professors on arrival took only five of us, whom he requested to stay. 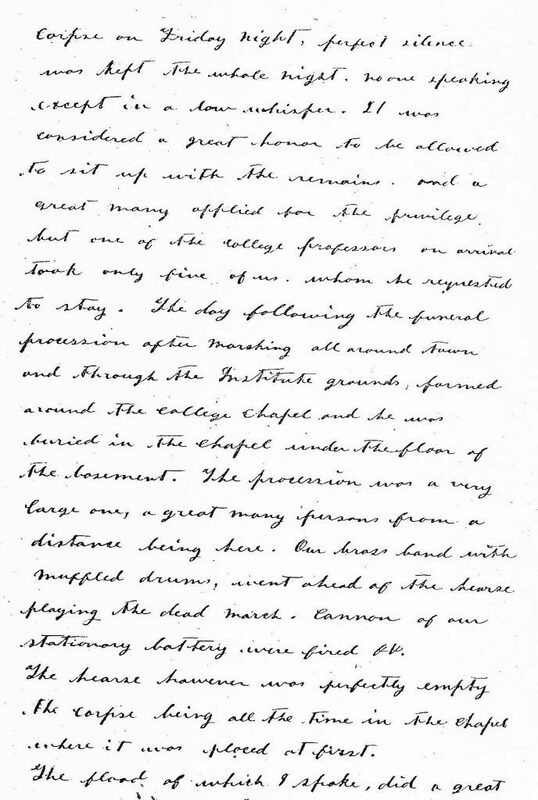 The day following the funeral procession after marching all around town and through the Institute grounds, formed around the college chapel and he was buried in the chapel under the floor of the basement. The procession was a very large one, a great many persons from a distance being here. Our brass band with muffled drums, went ahead of the hearse playing the dead march. Cannon of our stationary battery were fired & &. 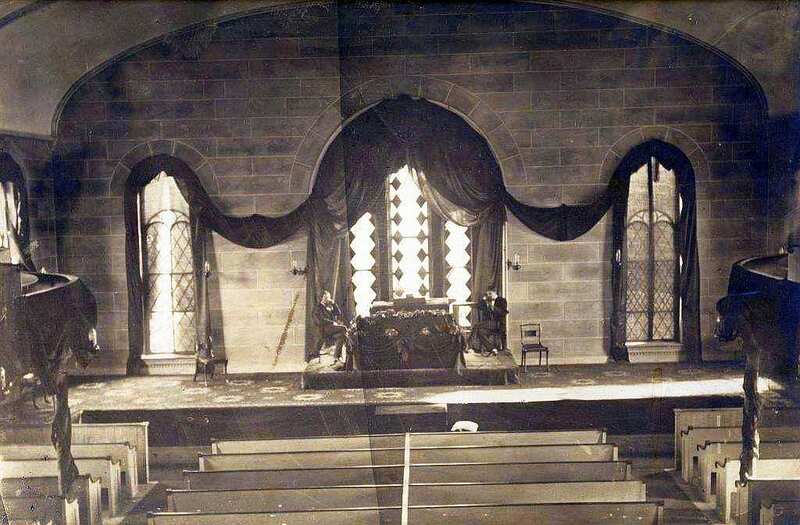 The hearse however was perfectly empty the corpse being all the time in the Chapel where it was placed at first. The flood of which I spoke, did a great deal of damage in this part of the country, carrying off some ten or fifteen houses, some dwelling houses some ware houses situated at the canal boat landing near here all the bridges in the river were carried off and the canal running to this place entirely ruined, all the locks being torn up and carried off. 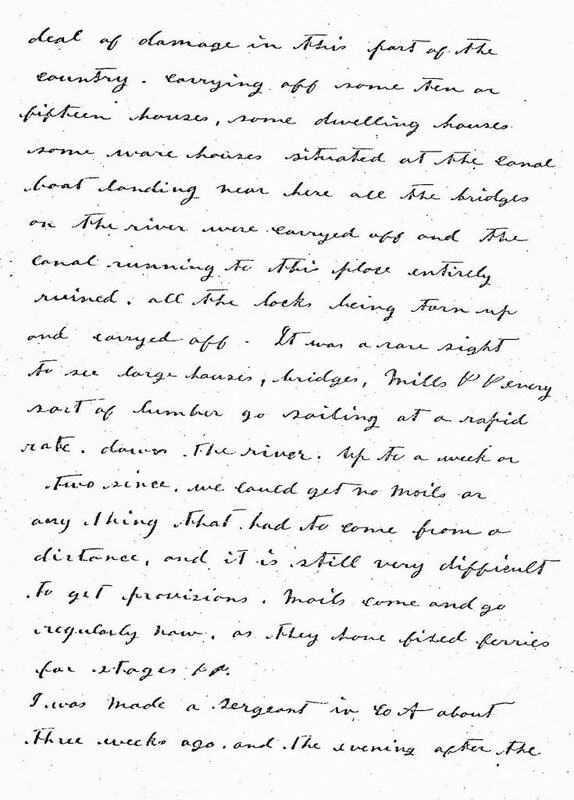 It was a rare sight to see large houses, bridges, mills & every sort of lumber go sailing at a rapid rate, down the river. Up to a week or two since, we could get no mails or any thing that had to come from a distance, and it is still very difficult to get provisions. Mails come and go regularly now, as they have fixed ferries for stages &&. I was made a sergeant in Co A about three weeks ago, and the evening after the first appointment, I was appointed color sergeant. I have to carry the battalion flag and have charge of the color guard, do not wear any such accoutrements as cartridge box and bayonet scabbard, when I am in charge of the guard, as the other sergeants have to do, but wear only a sword and sash, go to church in the staff, and enjoy various other privileges Jessie is getting along very well, he seems to be a great favorite. I had him put in a room, with the best new cadets that I could find. One of them is a son of Col. Dulaney of Loudoun, the others seem very nice little fellows, and they are all about the same size. I am gettng along pretty well I think, and I written about all that I can think of at present. Let me hear from you soon and let me know whether or not Gen Smith sent pa the receipt for the deposit. Gen. William Nalle died on July 30, 1911. His own obituary identifies the details of his life. “Gen. William Nalle, for 3 years Adjutant-General of Virginia, died at his home at Culpeper Sunday afternoon after a long illness of typhoid fever. “Gen. Nalle was a native of Culpeper county, and had been associated with the State militia since early manhood. He was a graduate of the V.M.I. “Gen. 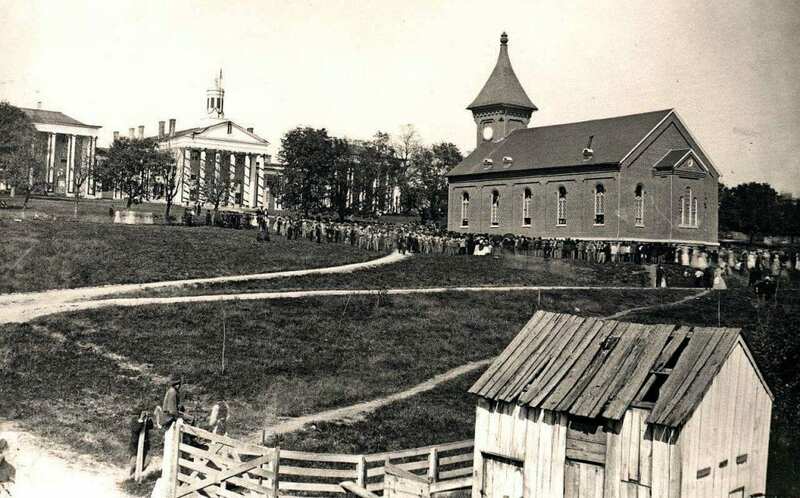 Nalle entered the Virginia volunteers July 28, 1879, as captain of the Culpeper Minute Men. He was elected major of the Third Regiment in 1882, and later was made lieutenant-colonel. He occupied the position of lieutenant-colonel until November 15, 1838 [1883? ], when he became colonel. “He was a thorough tactician, a soldier every inch of him, and a man who commanded the respect and admiration of all. He served two terms as Adjutant General, retiring when Gov. Swanson went into office. From: THE DAILY STAR, Fredericksburg, Virginia, August 1, 1911 (page 2, column 3).